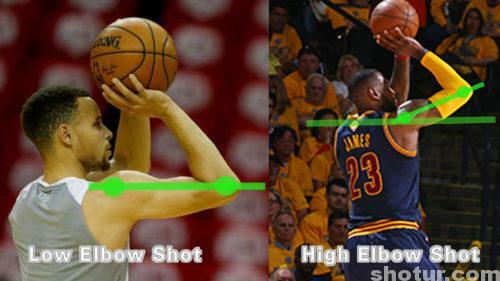 This time I will share you many new categories about basketball shooting. 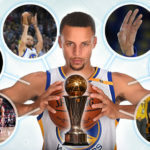 All the categories from my 10 years basketball shooting technical research summary, and I have published on my websites Shotnba.com and Shotur.com. 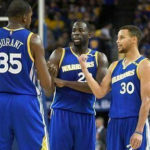 This video is very important, after you understant all the categories, you can choose the best shooting type which fit for your basketball playing style, and you will easilly to know the other videos of mine, because almost all my later videos will metion these shooting categories. The feature of soft hand shooting type is your hand will swing up and down after shooting, you must relax your wrist and whole your hand. Look on the side your hand is convex. Soft hand type for the long shot has a good performance and just need the release force as less as you can. 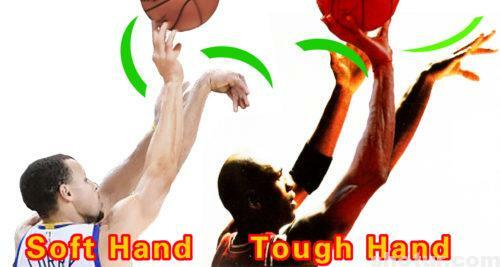 The feature of tough hand shooting type is your hand will be motionless after your shooting, you should make much force with your wrist. 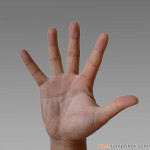 Look on the side your hand is concave. 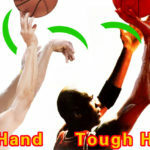 Tough hand type is good for perimeter shot and hang shot, especially good for the clutch shot, just because your muscle is more tight, your tough shooting will be more stable. Forward release we can also call it forward shooting. 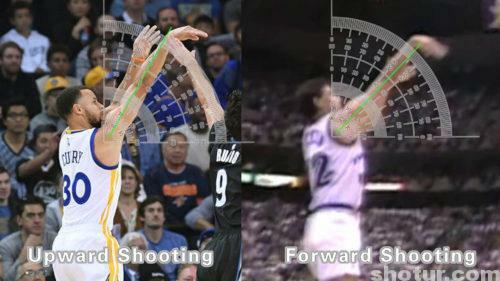 This shooting type is easy to grasp and good enough for perimeter shot with normal arc or even low arc. Just release the ball with forward force to the hoop. Upward release we also call it upward shooting. This shooting type is a little difficult, but if you grasp the skills, you will good at long shot with high arc or even shooting from downtown. 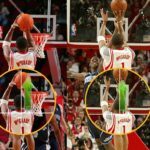 The upward release type include many different tips, in another word, we have many methods to shoot a ball with upward force. We need a high arc for our shooting because it will make our long shot more accurate. Shooting from head is relatively easy to grasp, the ball released from your eye sight, and you can just use your wrist and hand to release. The two arms are oblique, you can easy to make good balance in jumpshot in the air. This shooting type is good for close-in shot, but because the shooting main release force from the wrist, your long shot will be not stable enough because your force is difficult to accord the straight force theory. Shooting from shoulder is a little difficult to master, because your release force and your eye sight not in the same line, so you need a good aiming skill. 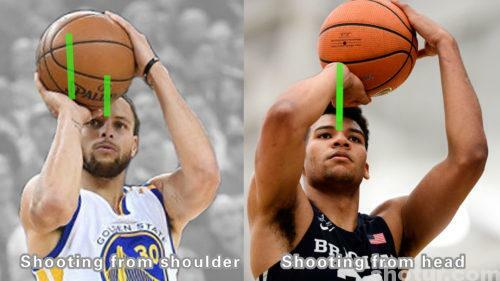 Shooting from shoulder is accord to the straight force shooting theory, your wrist and your fingers and your arm all in the same line, so your shooting skills will be good enough for long shot. 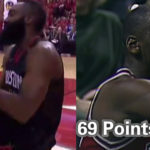 Almost all professional basketball players shoot with this type. 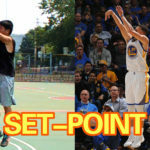 Standing Shot is a basic skill, just like free throw, our feet not move or jump, just shoot without legs movement. Shot Jump has two subcategories: Basic Shot Jump and Advanced Shot Jump. Shot Jump is also need jump, but we first make force to shoot and then jump, so we call this shooting type is shot jump. Basic shot jump is release the ball before you jump. The jump force just help you release the ball. 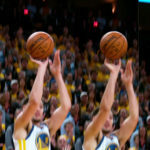 Many tough hand players shooting training with this shooting type. Advanced shot jump is release the ball just when you jump up or even just after you jump up. The release force all start before you jump. 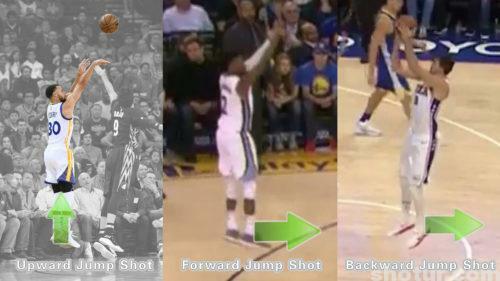 The cadence of this shooting type is very similar to the jump shot. 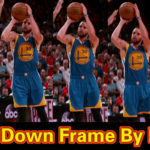 Many professional basketball players shooting training with this shooting type. Regular Jump Shot is we release the ball before we jump to the maximum height. 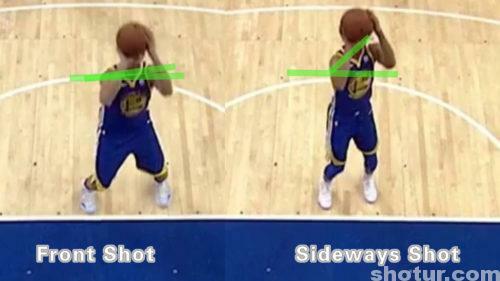 This shooting type just make less force to shoot the ball so we can always make a super long shot with this shooting type. Hang Jump Shot is we start make force to release the ball just after we jump to the maximum height. This shooting type is very stable for perimeter shot and clutch shot. 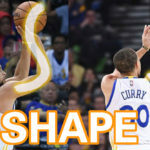 Front Shot is your body face to the basket, and after shooting your body almost still face to the basket. This shooting type is easy to grasp. Low Elbow Shot is your elbow lower than your shoulder or even in the same height when you make the set point. 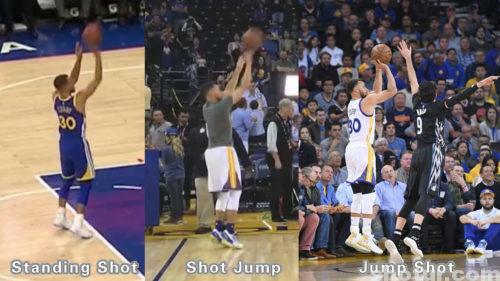 This shooting type always shoot with less force and very stable for jump shot. High Elbow Shot is your elbow higher than your shoulder when you make set point. 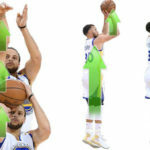 This shooting type is difficult to block, and you will get more self-confidence, but not very stable and easy to make your upper part of the body excessive backwards. 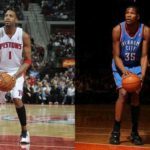 All these shots types we talk about are the normal shooting, not because the defence make your shooting posture changed or even fadeaway. Upward Jump Shot is after you shoot, your bady just jump upward and land almost to the same area. 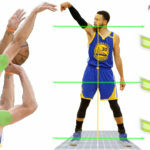 Forward Jump Shot is after you shoot, you will find you just jump forward and your body land in front of your shooting start position. 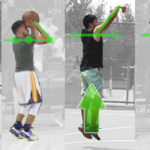 Backward Jump Shot is after you shoot, you will find your body is moving backward, that just because the shooting force inertia. 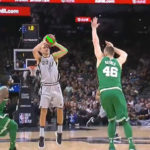 When you face to the basket, if your elbow more inside than your shoulder or just in front of your shoulder when you make the set point posture, that is Elbow Inward Shot. 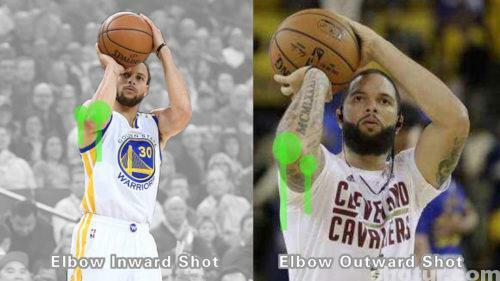 If your elbow more outside than your shoulder when you make the set point posture, that is Elbow Outward Shot. 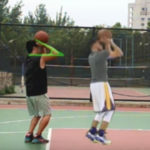 Borrowed Force Shooting is also called non-stop shooting, the shooting force gathered from a lot of force, not only release force, your jump force, hold ball force all gather into the release force. 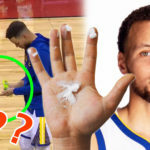 From you catch the ball, the shooting force is start, if you hold ball quickly and do not stop, release the ball immediately, you will shoot the ball with the least force. 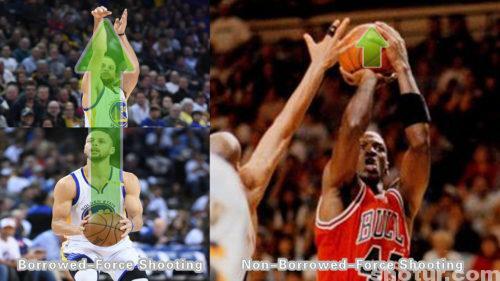 Non-Borrowed-Force Shooting is shoot the ball with only release force, you can stop your movement anytime, all the shooting force start from you finish set point, and you can still stop your movement with set point in a long time, just shoot with your right arm and right hand force. This shooting type is good at Hang Jump Shot and also can hit a super long shot. Please I cannot get in touch with you please can you explain to me about the sideway shooting, and how to properly do it. Sideway also mean lateral, I will create many videos and articles for this skill. You can turn your upper body 60 degree only.